Our Tusk Terrabite tires have many great features like a super heavy duty 8 ply carcass, radial consruction and DOT certified! To make it even better the Terrabite is easy on your wallet. These are very affordable tires that perform really well on hard packed surfaces like asphalt, rock and desert conditions. Check out the Terrabite and compare it to the other popular tires in the same category like the GBC Kanati Mongrel, STI Chicane, Sedona Rock a Billy and many more. - Our Terrabite tires generally ship out within 1 business day! - Great tire for general trail riding, asphalt, gravel, desert, rocks and more. - Affordable tire with one of the most popular tread pattern on the market. Great tire, aggressive tread, quieter than the stock bighorns. 8 ply hopefully will resist puctures better than the bighorns. 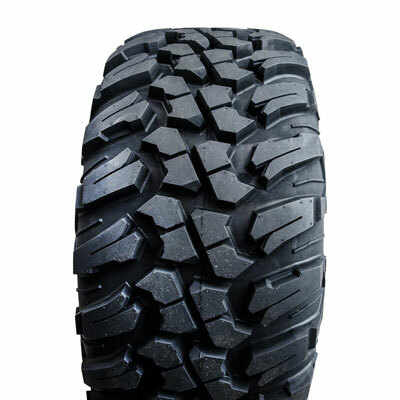 good looking tire, excellent all terrain tread pattern, handles well on pavement as well, reminds me of a BF Goodrich radial mud terrain truck tire. Great tires with an aggressive pattern. Ride great on the road and outstanding in the timber. Great traction. Havent went to far on these tires although I can already tell they have a smoother ride! Looking forward to see how well they wear. Pure Offroad service was fantastic recieved order in a day! Very impressed! Awesome tire, quiet on road, rips up the trail and look great on my RZR!! The best ride quality of any tire I have had. Strong 8 ply tire with great durability and longevity. Pureoffroad shipped them immediately thanks to all the staff! These are a good looking and riding DOT approved tire. The price was good through Pure Off Road and their customer service exceptional! I have recommended both the Tusk Tires and tire and Pure Off Road to other UTV owners. The tires were mounted on Tusk Beartooth wheels and put on a 2016 Can Am Defender. I only have a couple hundred miles on them but I really like the way they ride. Smoother and quieter than the stock tires. I ordered on Monday and they were delivered on Thursday. I have only good things to say about the tires and pureoffroad.com. Only been on one major ride so far, but they performed as expected. Very quiet and stable on pavement. Great tire, running 11 psi on a 2015 rzr trail 900 , very smooth and quiet, only complaint would be they do pick up and throw a lot of rocks. Excellent service and fast shipping as usual. Great price for a DOT rated tire. Shipping was very fast. Tires actually have more aggressive tread than I expected. They ride smoother and quieter on the road than the stock bighorn tires. They might be a little stiffer on the trail. Have not really been on the trail with them yet, but they appear to have less give than the stock tires at the same pressure. The tire is 26.5 tall mounted, installed on RZR and 10 PSI. Very happy same height as stock bighorns. No clutching changes needed to run this great 8 ply dot tire. I purchased this as a spare for my RZR. Nice tire with a good tread. Good tire, excellent value, fast shipping. Haven't really had a chance to test the tires out but they look awesome and the shipping was lightning fast! I ordered in a Wednesday and they were at my house in LESS THAN 24 HOURS!! Great tires and great service! Shipping was fast and the tires are awsome. Thanks for making riding more enjoyable. very fast shipping, superb upfront service to ensure I was ordering what I needed. Would do business again any day. Love the looks of these Tusk Terrabite tires. Haven’t been out on the trail with them just yet but will soon. I had never used this website before. They responded to about 4 emails before I purchased. Received tires in less than 48 hours. Love the tires!!!! They look good and perform very good on my Ranger 570. 3/4 inch tread and are very smooth on hard surfaces. Q: How much do the 28X10X14 tires weigh? A: approximately 35 lbs. per tire. Q: What width rims are acceptable for the 28x10x14 Terrabite? A: 14x7 is what we normally use with that size of tire. 14x8 would also work. Q: what is the tread depth of the 30x10x14? Q: Will the 27 9 12 fit on a 2016 rzr 570 trail which came with 25 8 12 and 25 10 12? Q: What's the weight of the 28X10R14 vs the 30X10R14? A: Yes these 27 inch terrabites fit the Ranger 900 just fine. These would be a great option! A: 28 lbs. on the fronts, 30.5 lbs. on the rears. A: Yes these run really close to size. A 28x10 is right at 28 inches. This can vary though depending on the size of rims you mount them on. Q: I can buy the 27x9r12 for 99.50 and the 27x11r12 for 104.00 have bought from you before will you come down? A: Unfortunately we don't have any room to budge on the price of this particular tire. Also, the 27x9-12 are on back order until the end of January or First of February. Q: Are these in stock? A: We almost always have these in every size. Once in a while there will be a temporary back order for certain sizes. Which size are you specifically looking for? Q: I have a 2017 general and It has 27-11-14 on the rear and 27-9-14 on the front, would I be able to fit 28-10-14 all the way around it with my factory wheels ? A: If you are keeping your factory wheels you will want to stick with 9 and 11 inch widths because your factory rims are different sizes. If you want all 4 to be the sameI would recommend buying new rims that are all the same. Let us know if you have any other q's. Q: What is the weight of the 32/10/ 14s vs. 32/10/15? To they measure the same height? Q: when will the Tusk Terrabite 27x9x12 be back in stock ? A: It's looking like the end of October 2016. Q: What size rims can be used for 27-11R-12? Q: Will this tire be made for 15" wheels in the future? A: We have not heard anything on that but I would guess yes, this has been a very good tire and I suspect they will release more sizes. Q: Will a 27X9X12 tire fit on my 2009 Teryx front wheels (like a Tusk Terrabite) ? A: Yes they will, as long as you have 12 inch rims on your Teryx. A: Unfortunately no, we don't have the 28 inch in stock right now. We should have more soon. 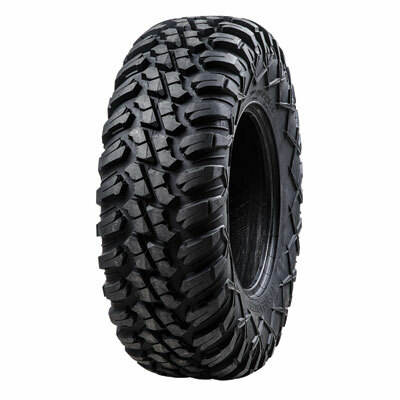 Q: Is this a good tire for a Polaris 800? Is tire durable for pasture and hunting use? A: Yes these are good durable tires. Very popular! For the money I don't think there is a better option. Q: What does a 28x10x14 Terrabyte weigh? A: The 28/10-14 Terrabite tires weigh 33.50 lbs. Q: Does the 28 inch include the tread, or is the total size 28 3/4 tall? A: The tread is included in the height. 28 inch is total with tread. Q: Are the 32” terrabites a true 32” tall? A: Like almost any tire they run a little short. About 31.5 inches tall. That can vary depending on the width of rims you mount them on. Q: do you have 4 in stock ready to ship? A: Yes we have plenty of these in stock in every size. Q: Weight of this tire? A: Which size do you need a weight on? Q: 2017 General - rear tires 27x11x14 with 14x8 rims; front tires 27x9x14 with 14 x6 rims. will the 14x8 rims be appropriate Tusk Terribite 28x10x14?? A: Yes, you could run 14x8 or 14x7 rims all the way around with the 28x10 tires. Q: Do the 27x12's run fairly true to size or do they run a little under since they are on 12" rims? A: Like most tires on the market, these are a little bit shorter than they are advertised. But the height can vary drastically depending on the size of rims you mount the tires on, your air pressure, the weight of the vehicle etc..
Q: Do you have qty 4 of the 25-10r-12 tusk terrabite radial tires in stock? A: Unfortunately no, the closest option we have in stock is the GBC Kanati Mongrel. 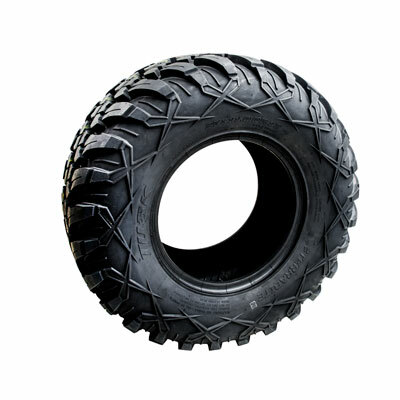 Q: Will 25-10-12 or 25-8-12 Terrabite tires fit a stock 2004 Kawasaki 3010 mule without rubbing or requiring a lift? A: Does your Mule have 12 inch rims on it now or are they the 10 inch rims? Q: weight of the 25x8x12 and 25x10x12? A: 24 lbs. each on the front. 28 lbs. each on the rear. A: This tire is not offered in the sizes you are looking for. The closest it comes in is the 27-9-12 and 27-11-12. We have many other great options that come in the 26 inch though. A: According to the manufacturer. The Max load is 680 lbs. per tire in the sizes you are looking at. These do not have a speed rating. The max PSI is 32 to seat the bead. The recommended PSI is 10-12. Q: hello, I have a Maverick trail 1000 DPS. it has 26x8-12 front and 26x9-12 stock. I'm wanting the Terrabites in 27x9-12 27x11-12 will they fit my stock rims? A: Yes the sizes you mentioned will fit your stock rims. Q: do you have 27x9x12 and 27x11x12 on hand? A: Yes we would ship these out the same day you order them.